As one of the higher priced telescopes of its class, the Celestron Omni XLT 150 Refractor Telescope has a lot to prove to customers that are looking for a good product. It delivers on many fronts, and besides being designed well covers a lot of ground when it comes to giving customers what they want. This is an all in one product that will last for years under the right tutelage. With this telescope you can see the Moon’s surface in great detail, and with the right pieces you can even see the rings of Saturn and its Moons. It won’t blow you away with any particular feature, but it is still one of the most balanced telescopes that you can get for the money. This is a refractor telescope sitting on a mount and pivot, with the tube taking on a short and thick form rather than the long a narrow of some of its competitors. It blends black and white into its form, with no quirky style whatsoever. The basic looking set makes the most of the room it has and everything is within reach. There are more comfortable points than uncomfortable ones, so expect it to have better viewing angles than some of your older telescopes. 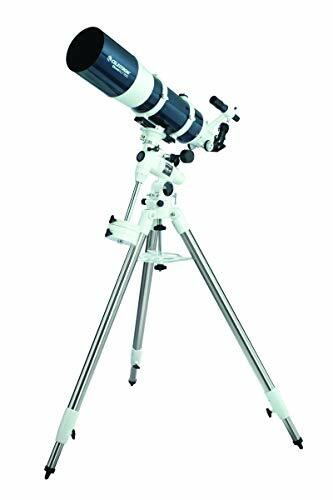 This is a very light and portable scope that will often make you the envy of any stargazing party you attend. This is where it gets a bit tricky for the consumer, since on the surface this would be considered an intermediate and up telescope. But realistically it is great for all levels, from hobbyist, beginners and so forth. The reason those levels are questionable is due to the lack of beginner material included, and from the bottom up this is not a user friendly scope. There isn’t a lot of direction, and although the features aren’t heavy, a beginner could easily get lost trying to figure out the simplest of controls. A determined user could have everything down on this model in about a day or two, so fret not if you are an ambitious beginner. Starting with the telescope itself, it is very durable and can take some respectable hits without breaking. Not that you should go and test its breakage level, but this won’t be the type of telescope to fall over and break into two pieces. The way it is built also protects the lenses a bit more than other models, although that might not have been intentional. The mount is one of the better ones in the business, and it is attached to a tripod that really holds things down well, even on uneven surfaces. Buyers can expect to have rock solid performance from this model if they take good care of it. Along with the extreme durability of the product, buyers will get a 2 year automatic warranty the moment it is taken out of the box. This is a very good warranty, and will cover the most vital parts of the telescope. Both the lens and the mirror are from Celestron’s highest line, so you don’t get cheap parts in an expensive scope. The CG-4 German Equatorial mount has some of the best slow motion controls you’re going to get in a telescope of this size. And if you want good light transmission then the StarBright XLT coatings does a great job of getting the best out of the light available. Expect maximum image quality, even in situations where other telescopes have failed. The price is of course going to be the first hurdle, with it being on the higher end of the scale. There isn’t a lot of help documentation with the product, so expect there to be a bit of a learning process for new users. What could turn into a rewarding experience can be initially frustrating if the user doesn’t self-teach themselves how to use the product. And coming in at about 65 pounds with no bag to carry it with can zap some of the portability out of it. And for the price customers can opt for a different product with motorized tracking, a feature that is very important if you want to watch comets with little to no trouble. There’s a good bit, starting with the 25mm 1.25 eyepiece and 1.25 T-thread adapter. These two pieces alone are hard to find unless you specifically choose an updated telescope. The tripod has an accessory tray that can hold 7 pounds, and it includes a counterweight of 4 pounds that keeps things steady. Considering the total weight of the product, the counterweight is at the perfect size to keep things perfect without it being overbearing. The only thing you won’t find in this package is a great guide, a truly informative manual and software that will get you through the first week. The price makes it a bit hard to swallow, especially without any reading materials, software or any electronic mechanisms. But even so there is a good amount of great features to play around with, and the durability of the product is second to none. While the scope is all powerful, it has a mount and tripod of equal value that will probably become the standard for when you buy any other telescope. So for the current price it is about right, it isn’t a bargain or a steal like some of the other telescopes in its category, but it is still in a league of its own. Expect for it to sell out if the price drops by a couple of bucks, even if it is a short sale. It will last for years without the need to upgrade, and if purchased for a beginner it can last as long as a decade. Don’t forget its superior durability, so it is expected to be around longer than any telescope on the market. Expect for there to be a lot of small extras bought over the lifetime of the product to keep it current. Even without some of the more advanced features of the upper tier telescopes, it has raw power that keeps it current enough. There is little to worry about since this isn’t going to be the type that needs to be upgraded anytime soon. A good comparison product is most likely going to be the Orion 10034 GoScope II 70mm Refractor Travel Telescope Moon Kit, which is significantly cheaper and comes with a carrying bag. On top of that it also has more accessories and instructional materials, something that the Omni XLT is sorely lacking. But that is where the fun ends, and the realness begins. The Omni XLT is 10x more powerful, has a sturdier base and mount, and better controls. Looking at the same image between the two is no comparison, and it makes it clear that the Orion model is for beginners and hobbyists only. So you’ll save some money upfront, but pay for it in product quality. Telescopes of this price that don’t have electronic features are a hard sell, but somehow Celestron pulls it off. They put together a winning combo of a powerful scope, and an incredible mount/tripod combo that is hard to beat.